Going to Extremes: A behind-the-scenes look at what it takes to get "the shot." Michael was featured in Outdoor Photographer in September 2001 along with several other well known photographers for his work photographing adventure sports. Above is the opening spread with Michael hanging 600+ feet off the ground while shooting with climber Kurt Smith in Potrero Chico, Mexico. Below is the article and caption. Their photographs captivate us. They see a scene from a perspective that looks completely unique and original. We look at the images and wonder, "How did they do that?" "Where did they have the camera set up?" In the following pages, you’ll get a glimpse of the incredible extremes the world’s most renowned photographers go to in order to get "the shot." What does it mean to be extreme? 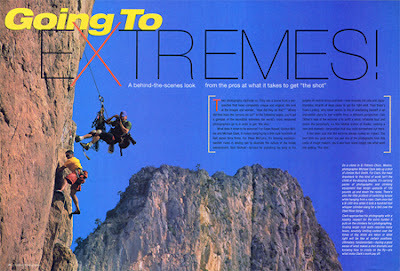 For Galen Rowell, Gorden Wiltsie and Michel Clark, it means dangling by a thin rope hundreds of feet above terra firma. For Steve McCurry, it’s braving monsoon swollen rivers in driving rain to illustrate the culture of the Indian subcontinent. Nick Nichols-famous for punishing his body in the jungles of central Africa and Asia-also endures the cold and claustrophobic innards of deep caves to get the right shot. Then there’s Frans Lanting, who never seems to tire of positioning himself in an impossible place to see wildlife from a different perspective. Carr Clifton’s idea of extreme is to outfit a small, inflatable boat and cruise the perpetually ice floe-riddled waters of Alaska, seeking a new and dramatic composition that may exist somewhere out there. It has been said that the extreme always makes an impact. The next time you gasp when you see one of the photographs from this corps of image-makers, you’ll also have some insight into what went into getting "the shot." On a climb in El Potrero Chico, Mexico, photographer Michael Clark sets up a shot of climber Kurt Smith. For Clark, the main drawback of this kind of work isn’t the climbing or the dizzying heights, it’s carrying the packs of photographic and climbing equipment that weigh upwards of 100 pounds up and down the rocks. There’s also the little problem of switching lenses while hanging from a rope. Clark once lost a $1,200 lens when it took a hundred-foot whipper (climber slang for fall) over the Obed River Gorge. Clark approaches his photography with a healthy respect for the extra burden it puts on the climbers he’s photographing. Scaling larger rock walls requires many hours, severely limiting control over the times of day shots are taken or what light will be like at certain positions. Ultimately, fundamentals-having a good sense of what makes a shot dramatic and knowing how to create on the fly-are what make Clark’s work pay off.